Dr. Quentin Young, physician to Martin Luther King and Barack Obama, died on Monday at age 93. CALIFORNIA — Dr. Quentin Young, the crusading progressive physician to President Barack Obama among others, died Monday at his daughter’s house in California. Young, 93, was a lifelong Hyde Parker and the physician to Obama, former Mayor Harold Washington and to writers like Studs Terkel and Mike Royko. According to people who had spoken to Young’s family, Young died on Monday at his daughter Polly Young’s house on Monday. Young was a lifelong advocate for a single-payer health care system and numerous other progressive causes, which he said in 2013 came from his youth growing up in Hyde Park. 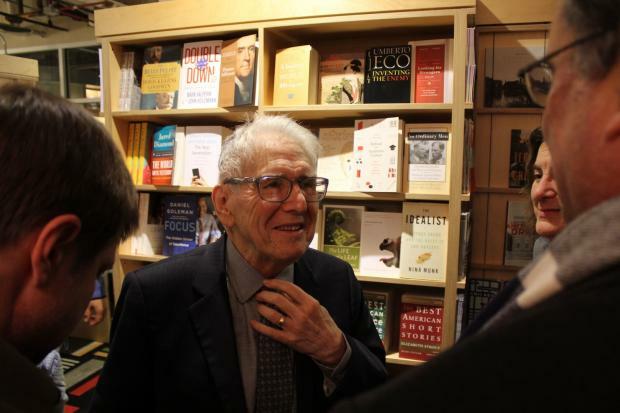 “I had the good fortune of being surrounded by progressive people,” Young said in 2013 when his biography was released about being surrounded by communists, progressives and other left-leaning groups in the neighborhood during the Great Depression. In the past three years, he had started to spend the winters in California to be closer to his children, Nancy, Polly, Ethan, Barbara and Michael Young. But it was only his second time every living outside of the neighborhood. Young served in the Army during World War II, but returned to Chicago and graduated from Northwestern University. He spent nearly 35 years at Cook County Hospital both treating patients and advocating for better health care for African Americans in Chicago. “The county hospital played a pivotal role in the black community, and they really thought it was theirs — it wasn’t theirs, it belonged to the Democratic Party,” Young said. He also ran his own practice in Hyde Park where he treated Rev. Martin Luther King Jr. during a march in Chicago. His regular patients included Terkel and Royko, who Young said always gave him a hard time. Young spent more than 25 years advocating for a single-payer health care system in the United States, a cause he continued to fight for until his death on Monday.